We worked closely with a research center in order to find how prospective technologies and design could help them. 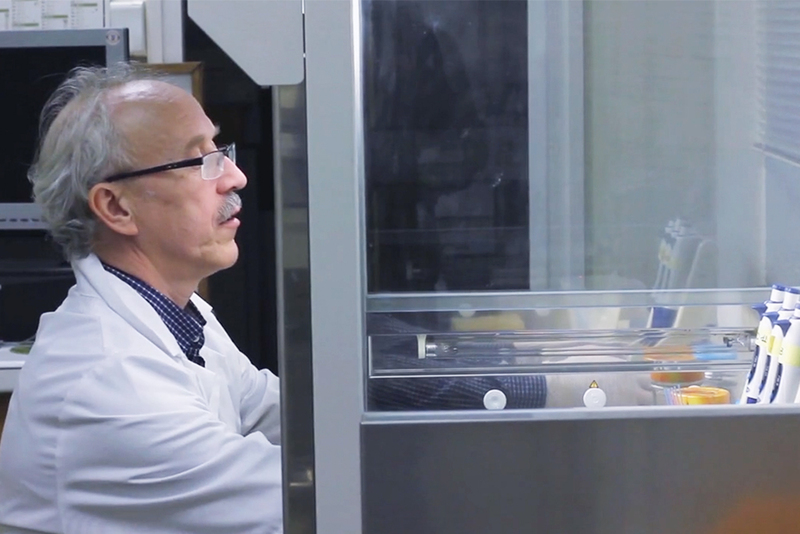 The product that came out of our collaboration focuses on enhancing the research workflow and assisting the scientists with their experiments. When starting the project, we had no idea about the needs of our users. We didn't even know who they were, what was their job, or what did their work environment look like. As I was in charge of defining the product and the user experience, I wanted to spend as much time as possible immersing myself in their world. I first visited the medical research laboratory in its whole and met the team. I spent some time with those researchers, observing their daily routine, trying to analyze their methods and taking notes. After observing the researchers at work extensively and talking with them, I took some time apart with the head of the team in order to discuss my notes together and hear from his experience and insights. The most interesting piece that came out of our discussion could be summed up like this: The technologies available to the researchers are more accurate and powerful than they have ever been, however, these evolutions do not necessarily improve the experimentation workflow as a whole. In order to start working on how we could improve the experiment workflow, I first had to breakdown a current one into comprehensible steps. The protocol is "a written procedural method in the design and implementation of experiments." It lists the details of a given procedure as well as the required equipment and instruments. Every day, there is a certain number of protocols that have to be carried out. The researcher quickly estimates the duration of each protocol. He then selects one of them and tries to remember the steps to follow. In order to carry out the protocol, the researcher has to prepare two samples, let's call them (A) and (B). The researcher prepares the heater machine by selecting the temperature and the weight. He then places the first sample (A) on the machine to get it to the right temperature. Using a calibrated pipette, he aspirates drops of the second sample (B). He then releases the drops (B) on a strip which allows for an easy observation. He analyzes the drops (B) on the strip using the microscope. The scientist can then check the condition of the sample (B) to avoid mistakes. When the two samples (A) and (B) are ready, which means the composition has been checked and the right temperature has been reached, the scientist can mix them into a new sample, let's call it (C), that he lets grow. The researcher puts one sample (A) into the other (B), and mixes them into a new sample (C). He then prepares the heater machine again, by selecting the temperature and the weight. He finally places the new sample (C) on the machine to get it to the right temperature and he lets it grow. Two comparative solutions can now be tested on the sample (C). Let's call them (X) and (Y). Using the microscope, the researcher checks the condition of the solution (X). After checking the first solution (X), he then checks the condition of the second solution (Y). He can now release two seperate drops of sample (C) on a double strip. He finally deposits the solution (X) on the first drop and the solution (Y) on the second drop. After mixing the sample (C) with the solution (X) and the same sample (C) with the solution (Y), they can now be compared by taking microscopic pictures of them and analyzing the results. Those new samples can be called (CX) and (CY). The researcher has to take microscopic pictures on the microscope of both samples (CX) and (CY). The pictures must be uploaded to a computer where the scientist can work on them. In order to compare the results, both pictures must be colorized using two different colors. After colorizing them, the pictures must be superimposed. From the pictures colorized and superimposed, the researcher can now compare the results. In order to stay on track during this prospective project, we first laid down the design principles that would guide us. We tried minimizing the movement of the researchers by gathering most functions in one place, instead of having to roam around the lab rooms to use scattered devices. Medical researchers aren't necessarily very proficient with new technologies. Actually, they are mainly used to analog controls. This is why we focused on building intuitive interactions and always kept those analog controls in mind as an inspiration. We tried automating as much tasks as possible, limiting any human input to where it is the most useful. We worked on defining the technologies that could be useful to enhance the workflow and that would also have their place in medical research labs. We kept in mind that the chosen techs didn't have to be available right now as we were talking about prospective technologies. A laboratory bench is a pretty plain surface (some would even qualify it as "dull"). By using augmented reality we could project relevant information on its white surface, turning it into a meaningful medium. In terms of hardware, an AR head-mounted display or AR contact lenses could be used, depending on how prospective the project would be. Touch controls would be an intuitive way for the researchers to interact with the information displayed on the bench. In a similar way to induction cookers, the benchtop could heat the samples and replace the heaters that are extensively used during the experiments. I regularly presented our advancement to the head of the research team, which allowed us to iteratively challenge and enhance our work. 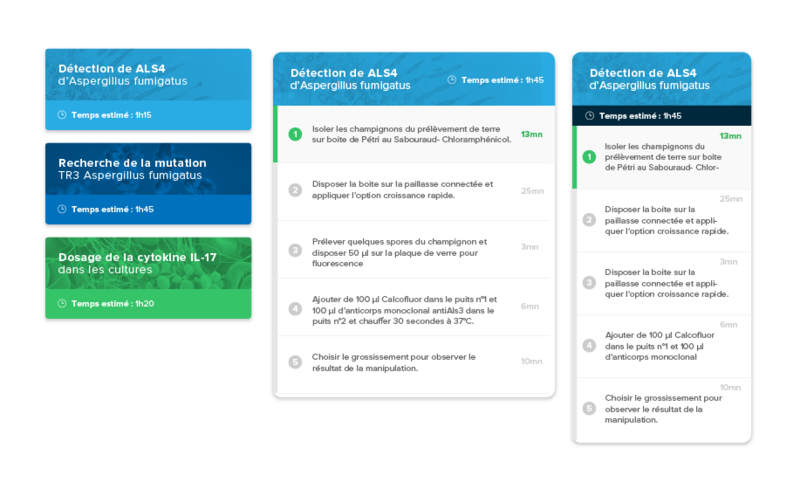 Our goal was to define the product features that would improve medical research workflows. We focused on conceiving an user interface that would flawlessly evolve according to the subsequent stages of the experiment, stating clearly the protocol details needed at any time. The interface also adapts to the environment it is displayed on. Simple tactile controls allow for very intuitive interactions. Drawing a zone with the finger to locally activate the heating is one of them. Settings can be set thanks to analog-fashioned tactile controls. Their "old-school" imagery helps researchers that aren't proficient with new technologies to interact with them. Thanks to electron microscopy, the bench can autonomously identify the nature of a sample, and display it as readable information for the researcher. The bench can also check samples on a strip to ensure their condition is good. After taking a picture with the microscopy technology incorporated inside the bench, the researcher can manipulate the image directly on the benchtop, instead of having to upload it on a computer and use a picture software. When two or more pictures have been taken, the researcher can superimpose them and compare them with the intuitive interaction provided for that purpose. Again, without this function the scientist would have to use computer softwares to superimpose the pictures and compare them. 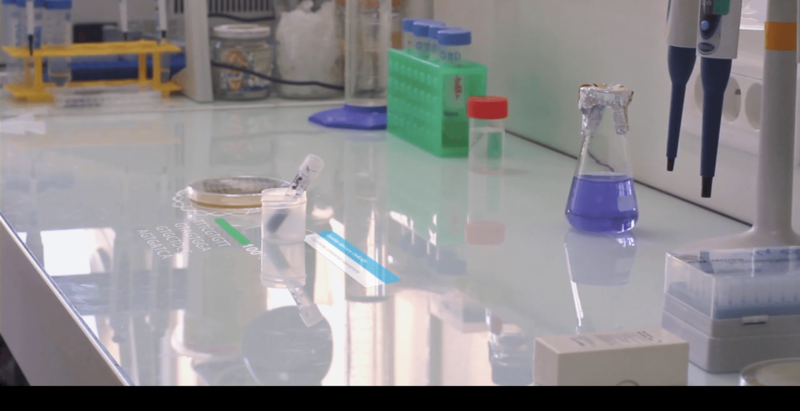 After conceiving our product features in collaboration with the medical research lab, we created a video which would communicate our work to the layman. This was also the opportunity to say goodbye to the team for the last time while shooting videos in the lab. During this phase, I worked with Maxime Bénéteau who, besides having a lot more experience than me shooting short videos, is a very talented amateur filmmaker. 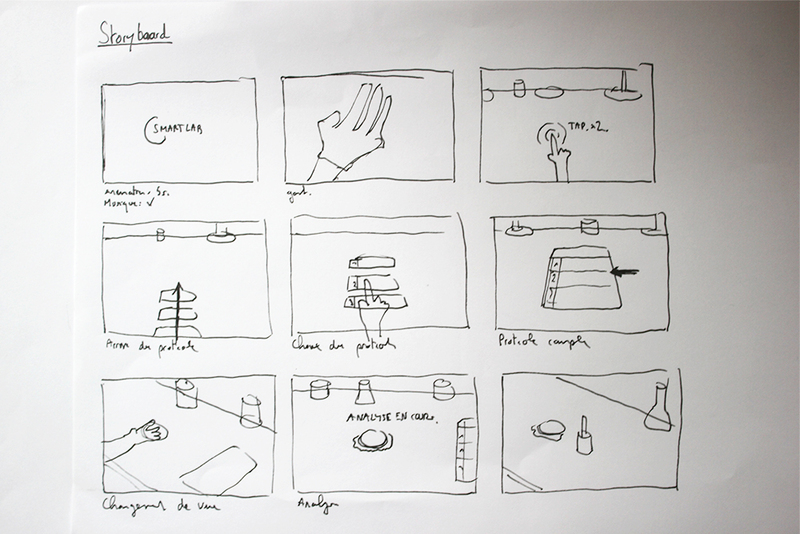 Together with him, we built the storyboard that would follow a real protocol. In terms of interface production, Maxime designed the information cards along with their different states and behaviours, and I designed the visual effects and interactions. Here is roughly how we split the workload between the two of us. 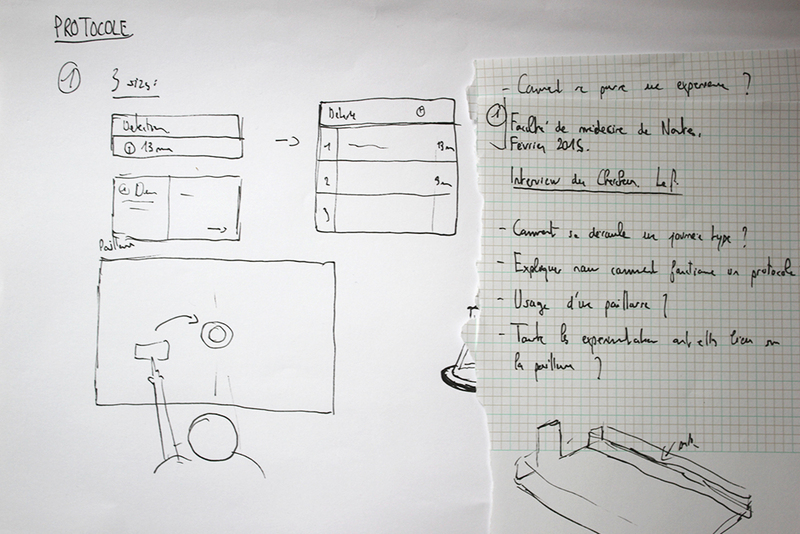 I was in charge of the concept design and UX while Maxime mainly worked on video prototype. After working on the concept design as well as on the UX with the medical research team, I produced the visual effects for the video on Adobe After Effects. Maxime took in charge the shooting of the video. He also built the information cards along with their different states and behaviours, and we worked together on the storyboard. In order to work efficiently, it was important that the two of us would use the same softwares. We used Adobe After Effects instead of Adobe Premiere because most of our video is based on special effects. Plus it is a tool that we frankly love. Adobe Illustratror is very useful when working with After Effects because the workflow between the two of them is optimized. Thus being a better choice than Sketch in this case. Thanks to his filmmaking experience and skills, Maxime took in charge the camera shooting. He used a digital photo camera and a tripod to capture a steady and high-quality image. We regretted not having a better camera at our disposal though. From this final phase we came out with a 2 minutes video that sums up the project through a defined protocol, emphasizing the different product features that we built along with the medical research team.